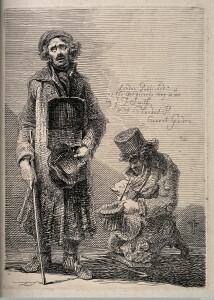 Two blind beggars, by John Thomas Smith. Etching (1816). Wellcome Library, London. The printing of embossed books for blind people began at the end of the eighteenth century, after Valentin Haüy invented the process of embossing letters from the standard Roman alphabet on paper in 1784 in Paris. Printing presses for embossing books were established on a small scale in other parts of Europe (such as Vienna, with the invention of Klein type in 1807), but it was following the end of the Napoleonic wars in 1815 that experiments began to spread more widely. 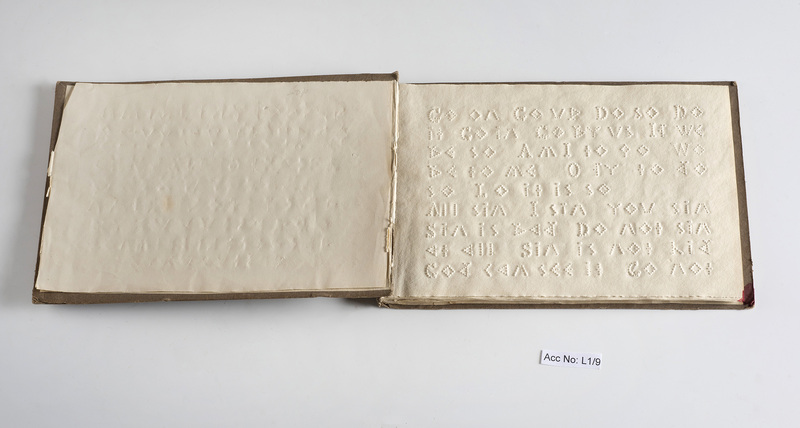 Embossed literature developed in the context of new philosophic and medical understanding of tactile ability, as well as a social concern to extend literacy skills – and hence employment – to blind people. Indeed, the Napoleonic wars added new urgency to this issue as many veterans returned home with visual disabilities caused by injury and disease, reinforcing the long-standing association of poverty with blindness, as this image from 1816 by John Thomas Smith illustrates. 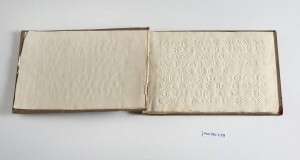 The inventor James Gall introduced embossed literature to Britain with the 1827 publication of his first class book for blind people in a raised angular letter type: within five years fifteen raised alphabets were submitted to a competition held by the Society of Arts for Scotland, Edinburgh. In Britain, religious groups were largely responsible for the establishment of embossing presses, keen to spread the word of God to new communities. Please follow the links in each item for more information where available. The information provided includes historical information about different raised print systems and their inventors; object descriptions; and illustrations. Unknown, The First Class Book for the Blind (Sunday School Union: London, 1840; Edinburgh, J. Gall). Gall type. RNIB Collection. The Gospel by St John for the Blind […] Containing some Historical Notices Regarding the Origin and Establishment of a Tangible Literature for Their Use (Edinburgh: 1832/34). Gall type. RNIB Collection. Unknown photographer. Unknown Woman Reading an Embossed Book, tintype photograph (c. 1860s). Private collection.